Revealing an impact increase from previous month of 592 to 635 children and seniors with disability. We’re working on improving our operational efficiency so we can bring on a new program this year. So if you know of a great program or nonprofit in IL, CA or WI please be sure to let us know – click here to write us a note. Another way to help move our mission forward is to support us with a re-occurring monthly gift. 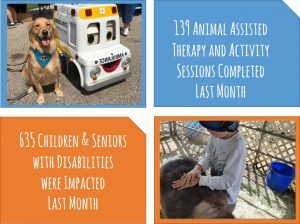 It takes an average of $27 to provide an hour of animal assisted therapy or activity to child or an elderly patient. That is less than a dollar per day. Please consider a tax-deductible gift today. 1 1FUR1 Ambassadors provided 1 visits at Casa Central Chicago, IL to 75 seniors with disabilities.